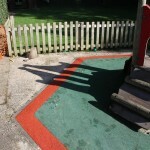 We are proud to offer one of the UK’s best safer pour surfacing for playgrounds. Safer pour is also known as Wetpour or bouncy rubber / poured in place has many properties which make it a perfect safety surfacing for public play areas and school playgrounds, these include porosity for water drainage, strong durability, multi-use and shock absorption. 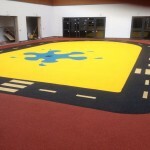 These safety benefits offer an excellent, durable flooring type to ensure that children are not injured and can ensure that they have as much fun as possible. 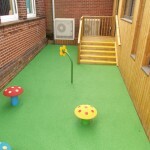 Wetpour allows the children to enjoy their break much more than before due to the many different graphics we can supply. For example, graphics of insects such as caterpillars allow the children to fully engage with their friends during their break. Most of our graphics also offer an educational learning aspect for the children as well due to the use of numbers or letters. On caterpillars, we commonly provide numbers in contrasting colours to fully emphasize them to the children to ensure they completely utilise the whole of their break. Soft Tarmac is perfect for areas like parks, play areas and schools as it is not limited to specific sizes and dimensions, can be made and specified to different designs and colours and can also be constructed over different types of sub bases. Sub bases for a safer pour surface include Asphalt Tar Macadam, No Fines Concrete and MOT Type 1 Stone and the poured in place safer surfacing can achieve specified Critical Fall Height ratings over these bases, typically from 1.0m to 3.0m, depending on the system depth and application. 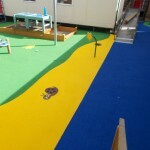 Safer pour rubberised crumb surfacing or Wet pour can also have a variety of different graphic designs installed as standard, perfect for children’s nurseries and as surfacing underneath play equipment. All Wetpour soft rubber flooring is installed to BS 7188 as standard and is made from a wearing course safer pour rubber EPDM and a base course safer pour rubber of SBR, both mixed with a binder and installed with a trowel. The macadam is a great surface for sports such as tennis and can be installed as a MUGA using line markings to create a facility that can host a range of different sports. If you wetpour surface becomes damaged, there are numerous ways this can be resolved. If the damages are minor, we commonly tend to distribute wetpour repair kits to allow the client to save time and money. The repair kit consists of binder, primer, wetpour and a pair of rubber gloves. However, if the damages are quite severe, our team will be able to provide an excellent repair service to make sure that your surface is completely efficient. We would love to discuss your project and would love to provide you with help and information. Quotes, costs, pricing and budget information are all available, as well as information about how you could get financial help for your project through a funding grant. If you would like to hear more, please feel free to contact our specialist team and ask any questions you would like answering. We are always happy to help you find the answers and can provide you with a wide range of information on wetpour surfacing.